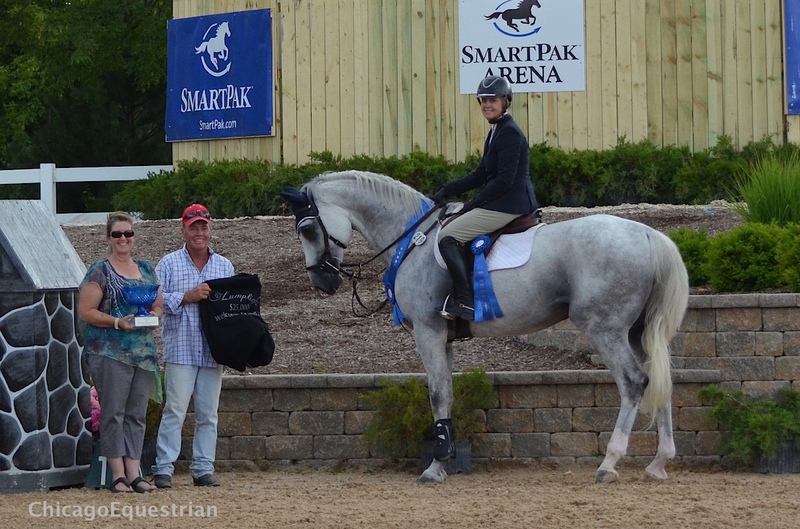 Tracy Fenney and MTM Reve Du Paradis catch the fastest time to win the $25,000 Welcome Grand Prix at Equifest I.
Wayne, IL – July 23, 2015 – The $25,000 Welcome Grand Prix was the highlight of in the SmartPak Grand Prix Ring at Equifest I at Lamplight Equestrian Center in Wayne, IL. Thirty-one entries took a swing at the Manuel Esparza designed course. Esparza, of Mexico City, Mexico, was an Assistant Designer for the Olympic Games in Atlanta in 1996, Sydney 2000, Athens 2004 and Beijing in 2008. Tracy Fenney and Andrew Kocher took the top five spots in the class. Thirteen horses cleared the track to move into the jump off with jump number seven, an oxer after a left hand turn with wavy planks, coming down frequently along with a skinny vertical after the triple bar in a short five strides, also taking its toll on the riders. Eparza set a wide oxer at the end of the track riding away from the gate, which cost more riders their chance at the jump off. Kocher, Lake St. Louis, MO, had seven chances for the top check with five of those chances moving into the jump off phase. 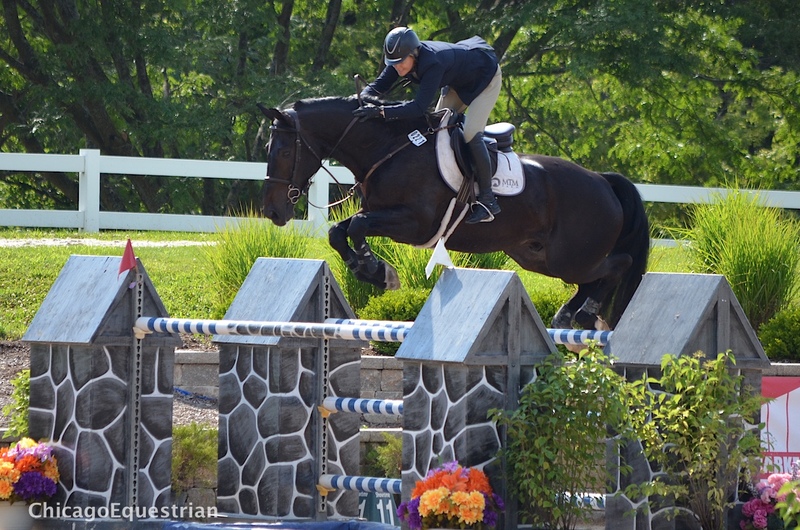 Tracy Fenney of Flower Mound, TX had three horses in the class with all three making the jump off. Kocher rode Filip first to test out the jump off track but left the ring with 8 faults. Fenney went back first on MTM Grand Slam and also added 8 faults to their score, having rails at the in and out. Kocher and Ora Del Te Di La San Giorgio finished in third. Kocher then had his chance on Ora Del Te Di La San Giorgio, owned by Ora Del Te LLC, and was the first clean of six, setting the pace at 38.011. The Fenney-Kocher chase continued as Fenney rode MTM Dumbledorf to a clear round, but not quite fast enough to catch Kocher with 41.578. Tracy Fenney and Dumbledorf took fifth. Kocher took another turn, this time with Bologna, owned by Shalanno Farms, Inc., putting in another fault free trip with a blazing time of 37.380 to take over the lead. Holly Shepherd tried to break up the battle with Loretta Patterson’s Triomph, but wasn’t quite fast enough with her 42.719. Kocher and Bologna shaved the turns for second. But Kocher and Fenney weren’t done yet. Kocher and his own Le Conte, clocked in at 39.864 with Fenney yet to go on MTM Reve Du Paradis. The Texan pulled out the big guns for a neat and tidy round, landing her 36.155 to steal the lead. Tracy Fenney and Michael McCormick in the winner's circle with MTM Reve Du Paradis. For an exciting round on Casino Royal, Kocher’s last ride, he galloped across the ring to catch the fastest time of the class, 35.782, but caught a rail in the in and out, leaving Fenney the MTM Reve Du Paradis, the winners. Kocher and his pet, Le Conte. Kocher took the second place spot with Bologna, third with Ora Del Te La San Giorgio and fourth with Le Conte. Fenney and MTM Dubledorf finished fifth and Holly Shepherd and Triompf were sixth. Fenney and Michael McCormick returned to Chicago after showing in the windy city last year. Kocher’s adrenaline was still flowing as he wasn’t the least bit tired from the heat and all his rides. 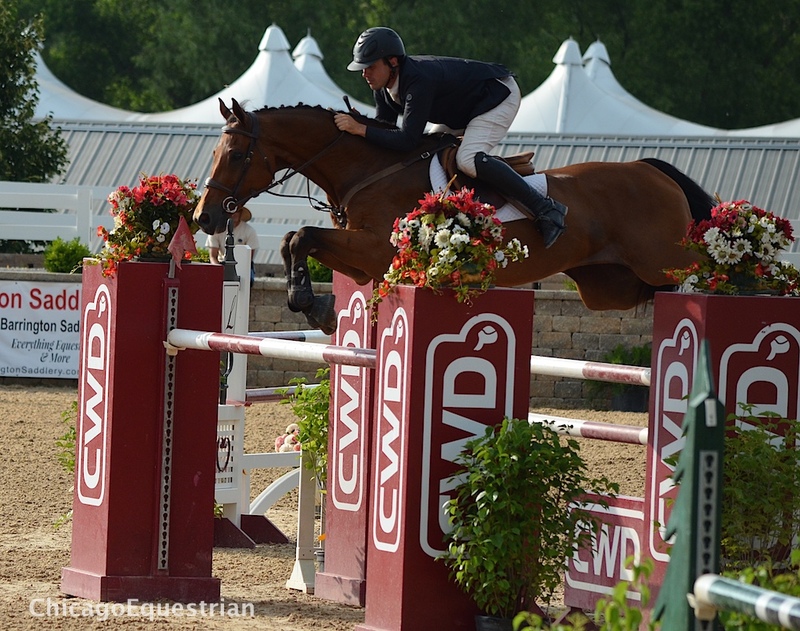 The jumper action continues with a $75,000 Grand Prix on Saturday. 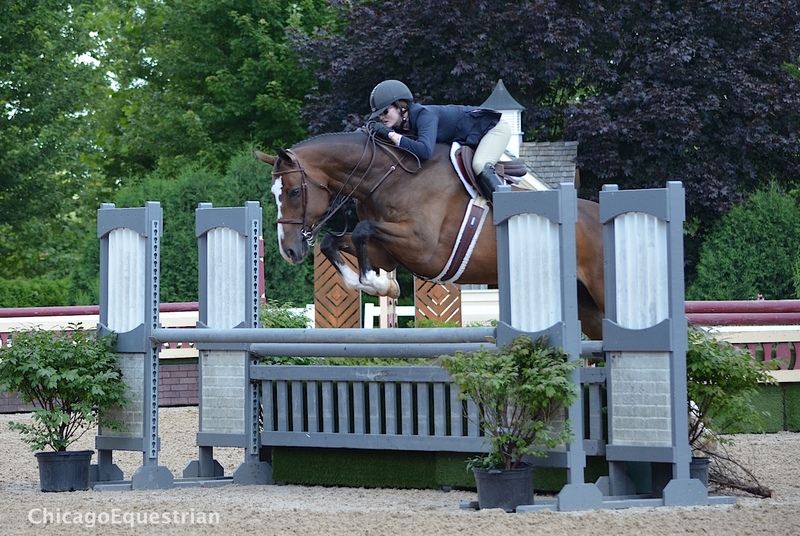 In the Wisconsin Equine Main Hunter Ring, the professional divisions wrapped up with the last of the over fences, handy rounds and under saddles for the championship titles. Jennifer Alfano was a force to reckon with in the hunter divisions, as her name kept popping up at the top of the judge’s list. Jennifer Alfano and Candid. clinch the First Year Green. Photo by Chicago Equestrian. In the First Year Green Working Hunters, Alfano of Buffalo, NY, and her own Candid took the Championship, winning two classes today and one Wednesday. 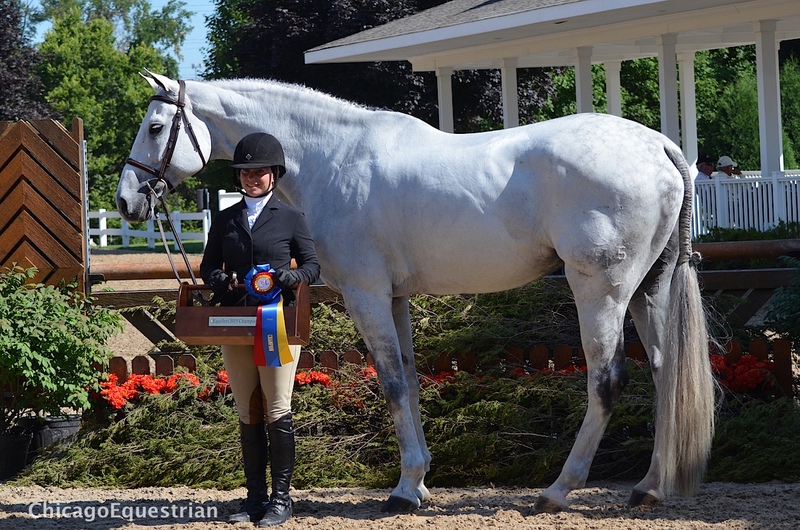 The Reserve Championship went to Bravo, owned by Stephanie Krause of Elgin, IL, ridden by Ryan Sassmannshausen. Jennifer Alfano and Jersey Boy Photo by Elizabeth Stein/Chicago Equestrian. Alfano has a fondness for the quirky types, as her famous derby mount, Jersey Boy, has been know to be a master at quirkiness, yet the pair has won numerous derbies, Championships and National Titles. 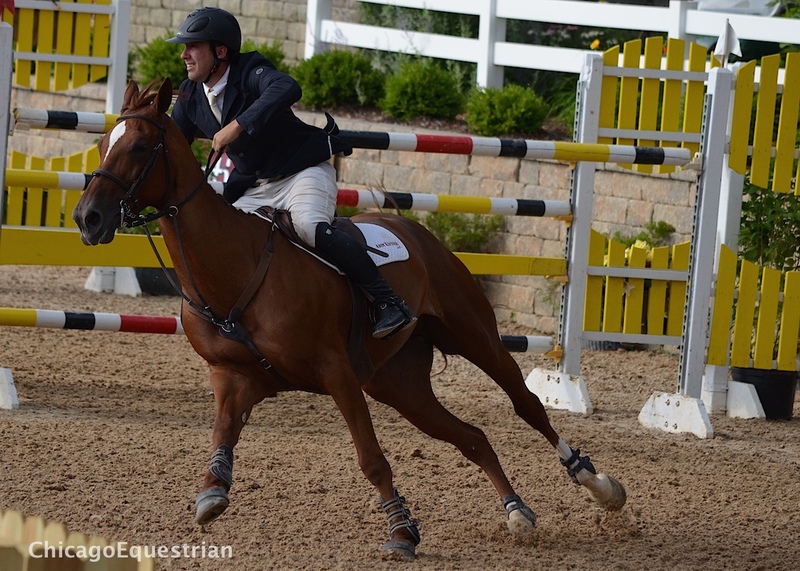 Jersey Boy and Alfano won three out of the four over fences classes in the High Performance Hunters for the Championship with Maggie May, owned by Billie Steffee and also ridden by Alfano, earning the Reserve Championship. Maggie Jayne and All Wrapped Up. Photo Elizabeth Stein/Chicago Equestrian. In the Conformation Hunters, Maggie Jayne of Elgin, IL and Our Day Farm’s All Wrapped Up took the Championship over Holly Shepherd and Cascaron, owned by Margaret Camp, Birmingham, AL. The Jayne’s Our Day Farm is just a short ride from the show grounds so Lamplight has been their second home for years. Maggie has taken up the job of showing all of the hunters while sister Haylie Jayne-Rolfe is due to have a baby in November. Tiffany Hammack and Ducati. Photo Chicago Equestrian. 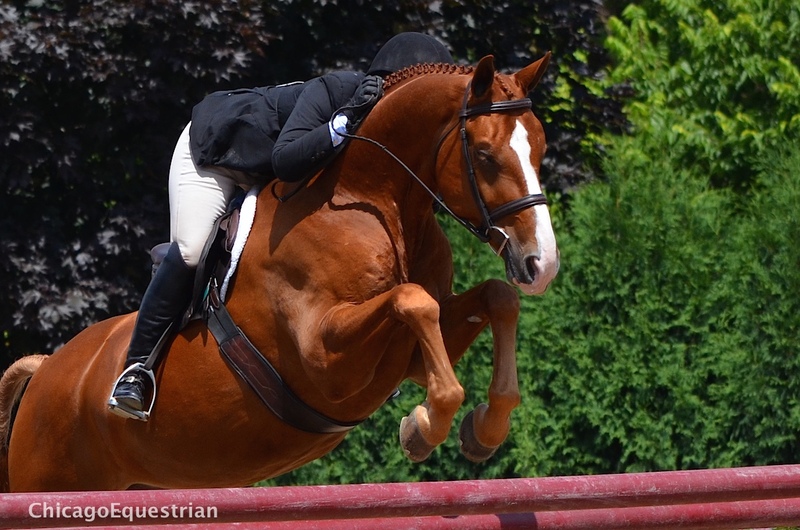 In the Performance Hunters 3’6”, Tiffany Hammack aboard Cassie Berke’s Ducati, won the handy round today, which along with her win from yesterday, earned her the Championship. Doug Boyd of Sapphire Farm, rode for Mimi Rothman, Glencoe, IL piloting Calido’s Son to consistent second place ribbons for the Reserve Championship. Hammack recently started her own business at Cassie Berke’s Notting Hill Farm. Hammack’s aim is to import, train and sell quality hunters and jumpers. 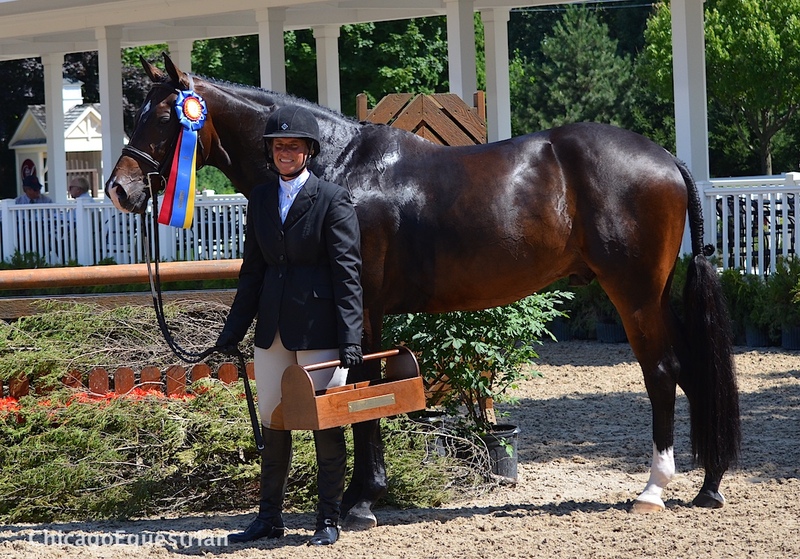 Jennifer Alfano and The Exchange top the $1,000 USHJA Pre Green Incentive Stake Class. 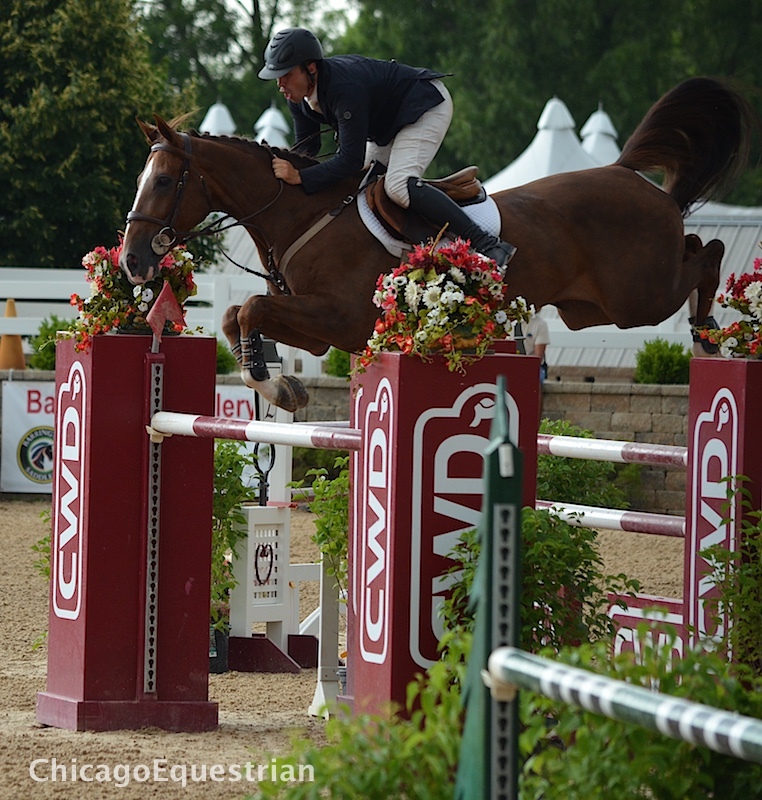 Photo Elizabeth Stein/Chicago Equestrian. 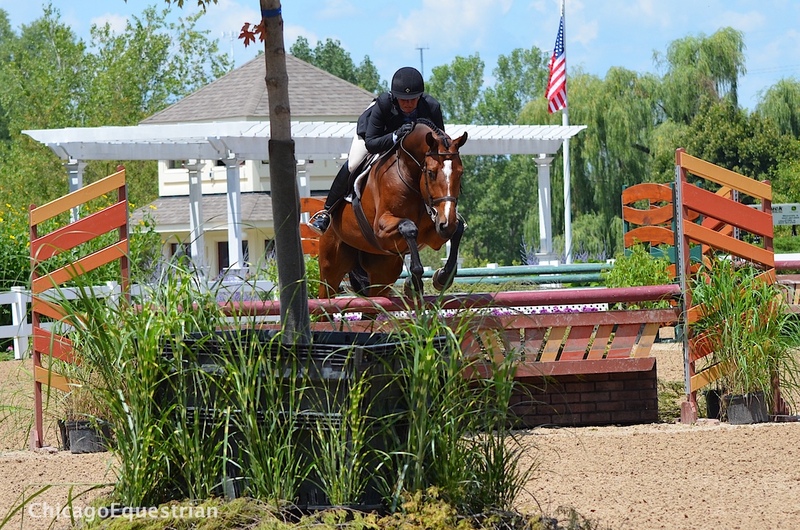 Alfano’s name came to the top of the list again in the $1,000 USHJA Pre Green Incentive Stake Class, where she rode SBS Farms The Exchange, to win the blue. Tiffany Hammack and Cassie Berke’s Claudius took home the second place prize. 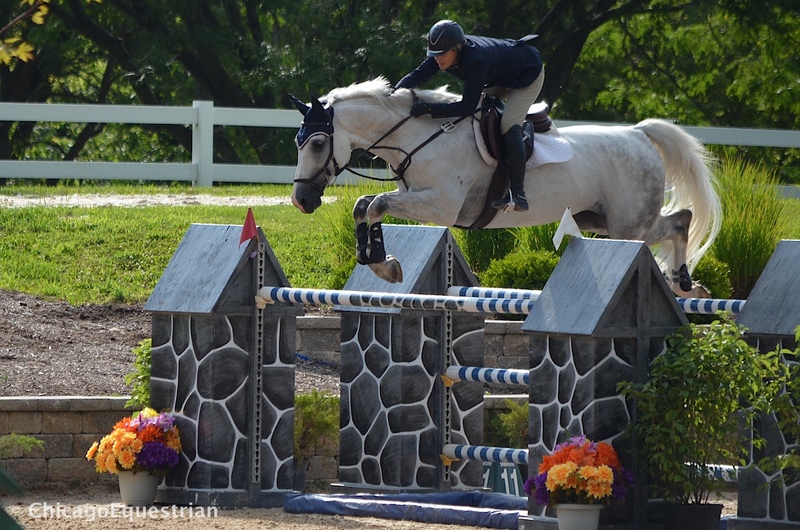 Equifest I continues with the $5,000 USHJA National Hunter Derby Friday morning and the $75,000 Grand Prix on Saturday at 4:00 pm.